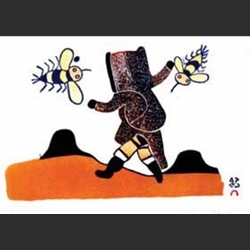 The intense voraciousness of insects in the Far North during the short summer is humorously illustrated by Pitseolak's quite benign take on bees. In fact, insects could be more than a serious nuisance. One year that they camped on the tundra, twelve of Pitseolak and Ashoona's family's fifteen dogs were killed by thickly massed flies (in Pitseolak: Pictures out of my life, by Dorothy Harley Eber, p.126).